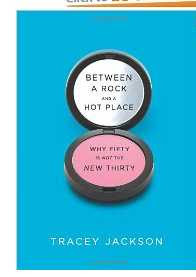 But I'm reading BETWEEN A ROCK AND A HOT PLACE by my friend Tracey Jackson. This book is funny as all get out. And despite the fact that she wants us to buckle down and face the demons of middle age, she is showing us how to do it with panache. Tracey is the nagging Mom you wish you had - the one that understands that you might have to be naughty as well as nice. I highly recommend this informative, amusing read. Happily, those words of wisdom don't stop me from listening obsessively to Katy Perry and Nicki Minaj. Not to mention getting a new tattoo and wearing navy blue nail polish. My friends think I'm having a mid-life crisis but I call it a spring awakening. Wow it's fun to be blazing again, thanks Nicki!